The Qualified Opportunity Zone (QOZ) program is perhaps one of the greatest tax breaks real estate investors will see in their lifetime. As part of the 2017 Tax Cuts and Jobs Act, Qualified Opportunity Zones were created to incentivize development and job creation in economically distressed communities. An individual who invests in one of the Qualified Opportunity Zones is eligible for preferential tax treatment in the form of both deferral and forgiveness. Any individual who incurred a capital gain in 2018, regardless of whether it was from stocks, art, trading, real estate or any other source, may be eligible for these tax benefits by investing in a Qualified Opportunity Fund (QOF). Your accountant just assembled your 2018 tax bill and calculated $150,000 in short-term gains and another $300,000 in long-term gains. Short-term gains are taxed at 37% at the highest federal level and long-term gains are taxed at 20%, bringing your entire tax liability to about $115,000. However, if you were to invest all your gains ($450,000) into a Qualified Opportunity Zone Fund, your tax liability on this amount would be $0 this year. QOZ fund investors receive a full deferral on both long-term and short-term capital gains. Plus, you don’t have to net gains against losses on your individual tax return. For example, if one of your investments made $300,000 and another investment lost $300,000, then you can elect to invest the $300,000 gain and take a $300,000 loss on your 2018 taxes today. Eventually, you will have to pay those taxes, but not until the year 2026. And, depending on the year in which you make the investment, you might only be obligated to pay 85% of today’s tax liability. The best part of the tax break benefit is that the invested capital grows tax-free, regardless of how much money it makes, but it must be invested in a Qualified Opportunity Zone for ten or more years. For example, if the $450,000 investment grows to $2 million after 15 years, you would owe nothing in taxes on the gain. Do All Capital Gains Qualify for Qualified Opportunity Zone Funds? Yes, all capital gains qualify for the tax benefits of a Qualified Opportunity Zone Fund, but it’s the timing that makes this investment complex. The law is written in such a way that capital gains must be invested within six months of being recognized. However, recognition is defined differently depending on the source of your gains. If your gains are from a partnership, they are recognized either at the time of the gain or at the end of the partnership tax year. Anyone with 2018 partnership gains has until the end of June 2019 to shelter those gains using the Qualified Opportunity Zone tax break. If the capital gain is from the sale of stock or a business, then the sale date dictates the time period at which the six-month clock starts ticking. For example, if you sold shares of stock in May of 2018 and generated $100,000 in capital gains, then you are outside the six-month window and those gains do not qualify for QOZ treatment. If you sold your business on November 15, 2018, then you have until May 14, 2019, to invest those gains in a QOZ fund. Managing expiring gains is complicated because due diligence on potential QOZ funds must be completed quickly and you must identify a fund you feel comfortable investing in before your gain expires. Adding to this complexity is the fact that QOZ fund operators can only take money when they have an intended use, which means they call capital when they find a deal. The inability to accurately identify the time at which capital will be accepted doesn’t bode well for those investors with expiring gains. However, don’t worry, as this won’t be the last opportunity to invest. QOZ funds will be actively investing until 2026, so there will be many more opportunities to line up gains with investment opportunities. The best position for an investor to be in to take advantage of this tax break is to have the ability to harvest gains at any time, as this takes the complicated element of timing off the table. For example, if you own a liquid security and it has appreciated substantially, you would simply hold the security while conducting QOZ fund due diligence and then sell the security at the time the QOZ fund is ready to take your investment. To be clear, it’s only invested money that is eligible for the tax shield. Simply committing money to a fund does not qualify the funds for the tax benefits. For investors who have complete flexibility in their timing, this should not pose a problem, but they may be waiting awhile. Finding economically viable deals in QOZ areas is not easy because the lines were generally drawn around distressed areas. That being said, many QOZ areas are transitional neighborhoods in the path of growth and capital will certainly find its way there first. These are the neighborhoods our team is focused on and has been for the last ten years. We believe this gives us a distinct advantage in the QOZ space but finding good-quality deals takes time and patience. “Working capital” is one tool fund managers can utilize to improve the flexibility around collecting capital gains, and we will certainly have this at our disposal for our QOZ Fund. The way it works is that a fund manager can call capital in advance of needing it for a project, so long as the manager has a purpose for the capital, a written plan to deploy it, and it is invested within 31 months. An investor with an expiring gain may be able to get into a fund earlier through this stipulation. However, if the capital is not actually invested within the allotted time frame, then the fund may lose its status as a Qualified Opportunity Zone Fund, so managers need to be absolutely sure a deal is going to close before accepting investments in this way. For example, we are in the process of working on a deal where we’ll develop apartment units in three phases. We will immediately call capital for the first phase and will have the flexibility to call capital for the second and third phases much earlier than when we need it. The advantage is that this allows the investor to lock in their tax break and it complies with the law because we have an intended use. Further, because we are not actually using the capital, we won’t charge fees until it’s time to put the capital to use. Balancing the interests of individual tax situations and complying with fund rules can be a daunting task for managers, but the tax benefits of this work are too great to pass up. 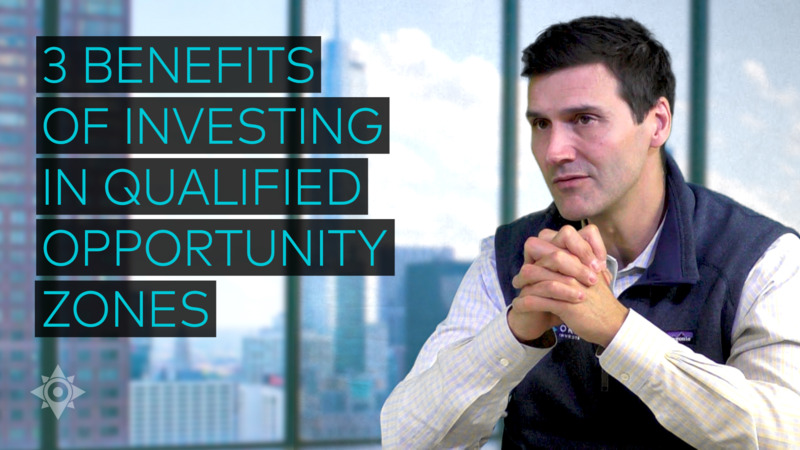 Watch Origin Principal Dave Scherer explain three primary benefits investors derive from investing capital gains into Qualified Opportunity Zone Funds. Qualified Opportunity Zone Funds are a ten-year or more investment and not all returns will be the same, so spend time to get to know the fund manager well. The tax perks of Qualified Opportunity Zones do not change the fundamentals of real estate and no one should invest simply to save on taxes. Evaluate the opportunity on its own merits and if you like it on a pre-tax basis, then you’ll love it on a post-tax basis. At Origin, we understand the balance between disciplined investing and the investor’s desire to put money to work, and it is a fine line to walk. Our goal is to accommodate every QOZ dollar we can over the next several years because we believe it’s the best wealth building strategy of our lifetime. The views expressed herein are exclusively those of Michael Episcope, are not meant as investment advice and are subject to change. This information is prepared for general information only. It does not have regard to the specific investment objectives, financial situation and the particular needs of any specific person who may receive this report. You should seek financial advice regarding the appropriateness of investing in any security or investment strategy discussed or recommended in this article.